If various advertisements keep appearing on your screen, there is a slight possibility that your system is infected with adware, for instance, Adanak. This piece of software claims to be able to enhance your browsing experience and even help you save money and time by providing various tools for finding the best prices and deals on such commercial websites as bestbuy.com, amazon.com, walmart.com, and similar. Unfortunately, this program is not as beneficial as it might seem at first sight because it is just going to flood your Internet Explorer, Google Chrome, and Mozilla Firefox browsers with a bunch of commercial ads. You should better erase Adanak entirely from the system because all these commercials might cause harm to your system. 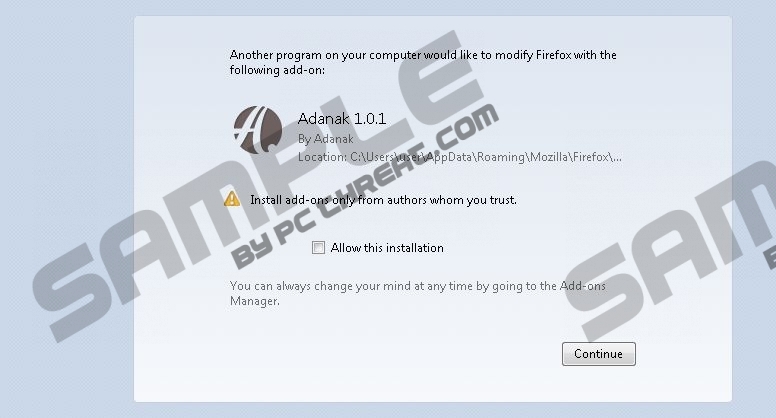 Adanak is not a very serious threat itself; however, you might still infect your system with malware if you keep clicking on those ads that it is going to generate. The specialists of pcthreat.com have found out that SuperWeb LLC, which is a publisher of Adanak, is not responsible for your safety; thus, you might be routed to corrupted websites after clicking on any of those ads. The content of these websites is unknown; thus, you will never know what you are going to find on them. The majority of advertising-supported applications tend to do perform various suspicious activities behind your back. Adanak is not an exception itself; as the research has shown, this application will collect information associated with your browsing processes unless you remove it from the system. Besides, it is capable of connecting to the internet without permission. In order not to let various suspicious programs enter the system in the future, you should always download programs from reliable sources only and install them with great care. However, if you want to feel completely safe, you should keep an antimalware tool enabled all the time. You should better delete Adanak from the system because it is not going to act in a beneficial way. If you want to save some time, you should definitely scan your system with a licensed tool and then remove all the threats by clicking on a single button. The best thing is that you will not have to worry about future threats if you invest in a reliable antimalware suite now. You should just make sure that an antimalware tool is completely reliable prior the installation on the system. Locate the application that has to be removed. Select it. Click Uninstall to erase it. Quick & tested solution for Adanak removal.